Baby Boomers are the new 18-49! 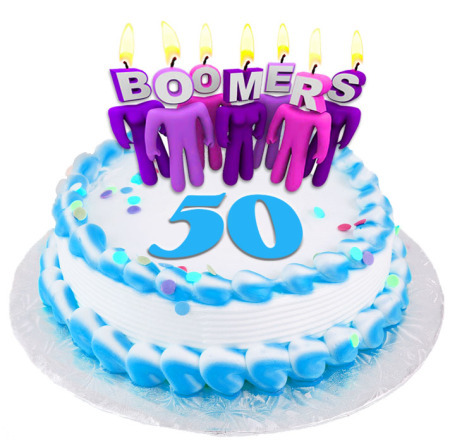 As of 11:59pm tonight, the last of the Baby Boomers turns 50! It seems only fitting that we end 2014 with a salute to those who make up more than one-third of the adult population in the Seattle market, and nationally control approximately 80% of personal financial assets, 60% of all disposable income, and account for more than half of all consumer spending. Born after World War II (1946-1964), Boomers were the wealthiest, most educated, active, and most physically fit generation (remember the Kennedy Physical Fitness Challenge?) as they strode into their income earning years. They also were the first to grow up genuinely expecting the world to improve with time; something you don’t hear much about these days. With parents who survived childhoods during the first Great Depression, the earliest Boomers were given so much more than previous generations, and then turned around and thumbed their noses at it (with the uncertainties of the Vietnam War providing strong impetus), only to return to those values as time wore on (with a few modifications). Even with all the dramatic social change, the one thing they didn’t leave behind was the appreciation of the work ethic, which has paid significant dividends. 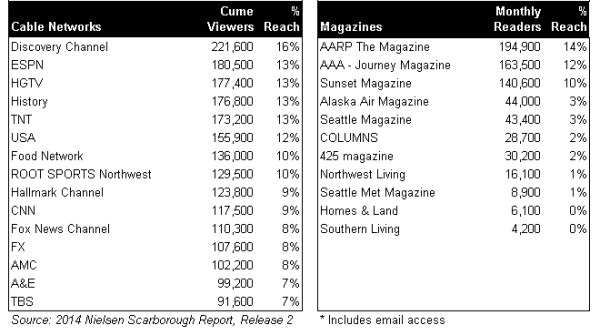 Looking at the Nielsen Scarborough stats on the Seattle DMA, Boomers number nearly 1.4 million (and number just 183,900 more than adult Millennials), account for more than $114 billion in household income and live in homes valued at nearly $417 billion. They also account for better than 40% of all spending in a number of key categories, such as carpet and floor coverings, lawn and garden, window treatments and new car sales. They are bigger spenders on fine jewelry, cosmetics/perfumes/skincare, men’s clothing of all kinds and shoes, full-service restaurant dining, wine purchases and grocery expenditures – even with so many being empty-nesters. In fact, among measured categories, Boomers significantly outpace all other age cohorts in spending in everything but fast-food dining, athletic clothing, children’s and infants clothing, sports equipment and women’s business clothing and shoes. They are second to Millennials in the amount of time they spend on the Internet and in mobile-device usage, yet spend $84 million more on Internet purchases. They also take more domestic and foreign air trips than any other generation; nationally they account for 80% of all luxury travel expenditures. Given these stats, one would think they would be the darlings of advertisers, but the generation largely has been shoved to the back-burner in favor of Millennials, along with the follow-up generation of Gen-Xers (ages 35-49). One recent study found that advertisers spend 10 times as much targeting 18-34 year old Millennials as they do on ages 50-65. Interesting, since Millennials and Boomers have a lot in common, and in many cases, they’re still occupying the same household! To illustrate, nine of the top 10 websites visited by Millennials are also in the top 10 for Boomers, and they share 15 of the top 20. More important, Boomers consume huge amounts of both traditional and digital media, including more time-shifted television than their Millennial counterparts. 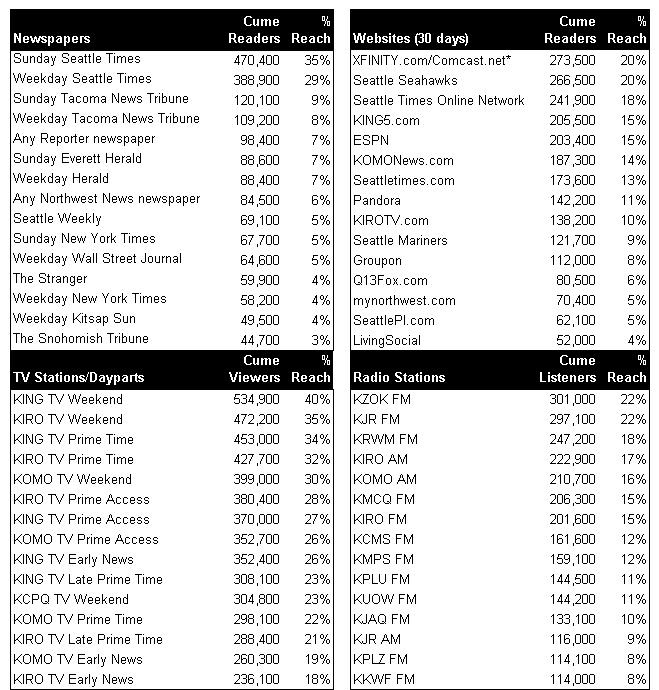 They also comprise one-third of all social-media users in the Seattle market, and nearly 30% of online TV and online video viewers, making them not only a lucrative target, but one in which reach and frequency are achieved rather quickly. Finally, according to a 2012 study from Nielsen and Boomager LLC, the 50-plus segment will grow 34 percent over the next 16 years, compared to 12 percent growth for those ages 18-49. 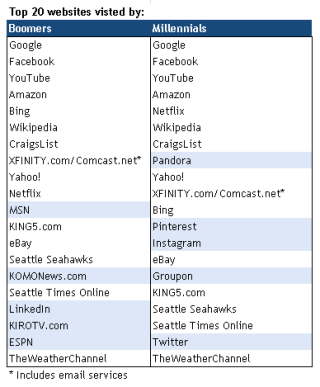 And really, isn’t it time to rethink the 18-49 targeting category? After all, it was created more than 40 years ago specifically to target the Boomer generation due to its market influence! That influence hasn’t waned; there is ample evidence that Boomers intend to continue consuming and doing interesting and rewarding things that cost money until the day they die. If actuarial stats prevail, they’ve got another 30 years ahead of them and they have both the desire and the discretionary income to make those years, and especially retirement, count. What’s more, it is estimated Boomers are set to inherit $15 trillion over the next 20 years. And let’s not forget, they not only buy for themselves, but also for their children, many of whom are Millennials, grandchildren and in some cases, great-grand children. Yet media buyers, especially those focused on upfront TV, just can’t manage to see audiences in the new ways they dictate… or the age cohort they have grown into! There seems to be a misconception that Boomers are stuck in their ways and won’t change brands, but multiple studies indicate they are just as likely to switch brands and experiment with new products as their younger cohorts. They’ve been around and they have been targeted all their (18-49) lives; they are savvy and discriminating consumers, and they are not afraid to change brands for a better product or service. While there is no argument that Millennials are the first to adopt new technologies, once they go mainstream, Boomers are quick to climb on board and actually account for the greatest expenditures and growth. Learning and experiencing is the hallmark of the generation, so technology isn’t a stretch for Boomers. Most of it has been developed during the course of their careers; they are comfortable with it as a tool and they are embracing it as a form of entertainment, plus they have the income to invest in it. And, as noted before, in many cases they are purchasing the technology their at-home Millennial children are using, so the awareness naturally crosses over. As long as this trend continues, they’ll also adapt to new products. Happy Birthday to the last of the Baby Boomers, and to all a Happy and Prosperous New Year!